Finance from only 0.99% and ear up to 15,000 Aeroplan Miles! 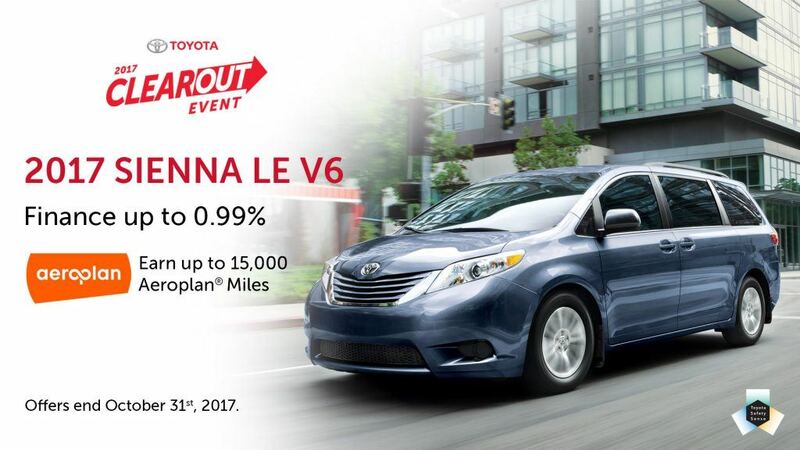 The Toyota Clearout Event is on now. Offer ends on October 31st. †† Vehicle Purchase (Special Bonus): Offer consists of a combination of: (i) 5000 Aeroplan Miles; and (ii) a limited time bonus of Aeroplan Miles on the following selected models: Corolla LE/Corolla S/Corolla XSE/Corolla XLE/Prius c/C-HR/86: 5000 bonus Aeroplan Miles (Total: 10,000 Aeroplan Miles); Corolla iM/Camry/Camry Hybrid/Prius/Prius v/RAV4/RAV4 Hybrid/Venza/Sienna: 10,000 bonus Aeroplan Miles (Total: 15,000 Aeroplan Miles); Avalon/Tundra/Sequoia: 25,000 bonus Aeroplan Miles (Total: 30,000 Aeroplan Miles); Offers valid from September 1, 2017 to October 31, 2017, are not retroactive and apply only to new models of the specific Toyota vehicles listed above when purchased/leased from a Canadian Toyota dealership. Excludes commercial fleet and daily rental transactions. Limit of 3 new retail purchases per customer per 12 month period. Toyota vehicle must be purchased, registered and delivered between September 1, 2017 to October 31, 2017. Customers must be an Aeroplan Member prior to the completion of the transaction. Offer subject to change without notice. Some conditions apply. See your Dealer for details. 6 Limited time purchase financing offer provided through Toyota Financial Services on approved credit on new retail sales of qualifying models. Finance example based upon MSRP of $37,015.00 financed at 0.99% APR equals $1,043.96 per month for 36 months with $0.00 down payment or equivalent trade-in. Cost of borrowing is $567.56 for a total obligation of $37,582.56. Taxes, Freight & PDI of $1,785.00, Air Conditioning Charge of $100 (where applicable), license; insurance, registration and applicable duties, levies and fees are extra. Dealer may sell for less. Time limited offer at participating dealer. Offer subject to change/cancellation without notice. See your participating Toyota dealer.